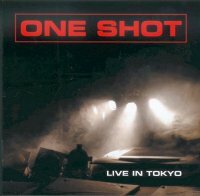 In 2010 One Shot went to Japan for a few concerts. This live CD was recorded in a small club in Tokyo on August 3rd, 2010. The sound of the recording is a marvel, the band never sounded better, huge dynamics in here! Emmanuel Borghi having departured the previous year, it is no surprise that he’s been replaced by Bruno Ruder who is also the new keyboard player in….Magma! He makes his debut on CD with One Shot here. The 4 guys must have been on fire that night for playing with such rage & density! The music bites, it is dark & it rocks – possibly with less jazz background that before. The stage is really the place where they are at their best, and this is fully evidenced here (their 2nd live recording with “Vendredi 13″ in 2001). A special mention to the rythm section of Ph. Bussonnet on bass & Daniel Jeand’heur on drums who were truly exceptionnal that night! To be played loud! 6 tracks – 63 minutes.